As Cory alluded to in our intro post, we’re excited to talk about a bundle that demonstrates an end-to-end Big Data solution: Realtime Syslog Analytics. Working with log data is a common Big Data task, and in this post, we’ll show how this bundle enables you to ingest, process, and visualize syslog data. This gives an admin the ability to know about login, cron, and other activity on a monitored system. This could easily be extended to work with different logs on different services in your cluster. 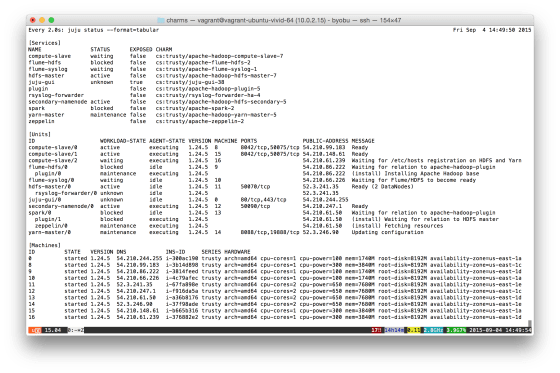 The rsyslog-forwarder charm can funnel events from any service that generates syslog data into this bundle. In this example, we’re using the HDFS Master unit (our Namenode) as the data source. We won’t duplicate too much of the bundle’s README here; you can find usage, testing, and scaling information from the previous link. However, we think restating some of the Overview is important to help describe what you see in the above image. You can learn more about getting started with Juju and quickstart here. When you’re ready, read on to dive a little deeper into the capabilities of this bundle. Once all of the charms have settled to a Ready state, deployment is complete. Use Ctrl-c to break out of the watch entered above. But that’s not very useful if you want to derive meaning from your data (e.g., at what time of day do I get the most failed login attempts to my HDFS Master, and where are they coming from?). For that, you’ll need to execute jobs and analyze results. But that’s about as cool as using hdfs dfs -cat to view syslog events. We’ve included another service that I haven’t mentioned yet: Apache Zeppelin. 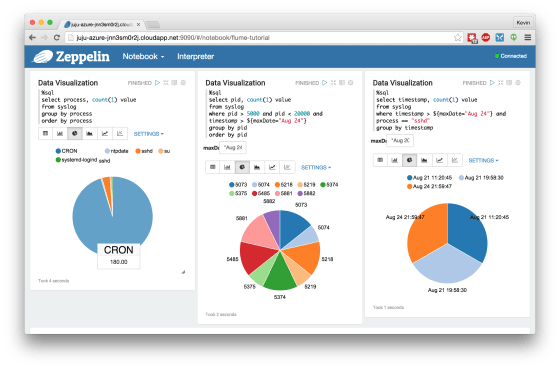 It’s a web-based notebook that offers a simple way to submit jobs and interact with your data using Spark (among other things). We provide a sample notebook in the Zeppelin charm to analyze the syslog events captured by this bundle. Once you have this deployed, see Zeppelin in action at http://<spark_unit_ip_address>:9090. Note: You can find the Spark address in the juju status output seen above. Remember to juju expose Spark and Zeppelin if required for your environment. I hope this has piqued your interest in some of the cool solutions we’re offering in the Big Data corner of the Juju ecosystem. We’re always interested in the Big Data problems you’re facing, so if you have questions/comments about this or any of our other bundles, reach out to us in #juju on irc.freenode.net.